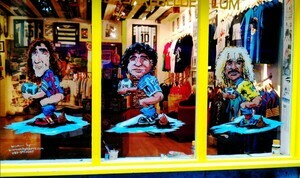 Best Christmas Window Paintings so far? Possibly Casa Rebelde (Sports Shop) on Crow St, Temple Bar with it’s “El Caganer” (“The Shitter”) themed windows. Posted in Misc and tagged Xmas Windows at 8:59 pm on November 25, 2013 by Aaron McAllorum.